The main reason to customize a connector is often to add explicit parameters. However, you may also need to modify the connector description, its assembly path when you move it from the original location, or the type name when the name of the class implementing the connector is modified. 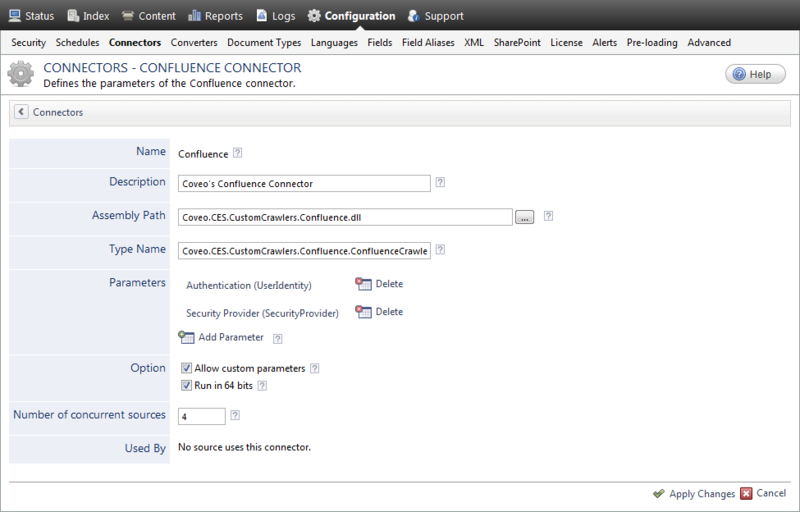 In the Connectors page, click the connector that you want to modify. In the page that appears, edit the parameters that you want to modify. The available parameters vary depending on the connector type. Example: The following capture shows the Confluence connector parameters. Allows to define explicit parameters. Click Add Parameter to display the Modify the parameters of the connector page (see Adding an Explicit Connector Parameter). Select the Allow Custom parameters check box to be able to create dynamic parameters (see Adding a Dynamic Parameter to a Connector Source).